Brazil is facing the most polarising election the country has seen since its military dictatorship ended in 1985. Given Brazil’s status as the country with the fifth largest population and the eight largest economy in the world, the results of this election will undoubtedly have consequences that will rebound on the international stage. 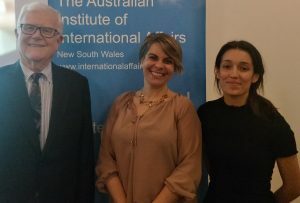 On Tuesday 23rd October, Dr Deborah Barros Leal Farias of the School of Social Sciences at the University of New South Wales treated the AIIA to a lively presentation analysing the nuances of this election and the way it is dividing families and communities across Brazil. Dr Farias began by explaining the nature of Brazilian politics, characterised by fragmentation and shifting alliances, with exactly 30 different parties represented in Congress at present. She highlighted the difficulties with this political structure, as it has resulted in the two leading parties, the Social Liberal Party (PSL) and Worker’s Party (PT), holding only 21 percent of Congress, and the overall top five parties controlling only 41 percent of Congress. This means that Brazil relies heavily on coalitions and partnerships, where ‘favours’ are commonly traded for votes and support, hindering effective and decisive governance. Dr Farias noted that that the surplus of political parties not only makes it hard for average Brazilians to cast informed votes, but also makes it incredibly difficult to pass meaningful legislation or change the constitution. Dr Farias outlined the circumstances of this current election. In the 7 October general elections, retired army colonel Jair Bolsonaro of the Social Liberal Party gained 46 per cent of the presidential vote while his nearest opponent, former mayor of São Paulo Fernando Haddad of the Worker’s Party, gained 30 per cent. Neither gained over 50 per cent of the vote, which was required to win the election in the first round. They will face each other again on the ballot papers this weekend; it is projected that Jair Bolsonaro will win. Dr Farias explained the tumultuous nature of the 2018 Brazilian campaign and the controversial nature of the candidates and their parties. Jair Bolsonaro has been termed ‘the Brazilian Trump’, embracing the image of the ‘strong man leader’ who will ‘bring order’ to Brazil. He has made controversial condemnatory statements against homosexuals and women, appealing to a more conservative base including a growing Evangelical community, and emboldening hate crimes over the past three weeks. Fernando Haddad has found himself running as a proxy for the divisive former president, Luiz Inácio Lula da Silva. Da Silva has been barred from running, being currently in prison on charges related to his involvement in the biggest corruption scandal Brazil has ever seen, ‘Operation Car Wash’. That scandal has tainted the Worker’s Party forever in the eyes of many Brazilians and has lost it majority support. To complicate the situation, allegations of fake news being spread to promote Bolsonaro’s campaign alleging illegal use of funds underpin a current investigation into his eligibility for president, meaning that Bolsonaro may not be allowed to become president even though it is highly likely he will win the election. Dr Farias emphasised the tough nature of this election for Brazilians, as deep societal divisions have emerged over religious values, women’s rights, abortion, and LGBT issues. The future president will have to deal with unemployment, widespread corruption, high crime rates, economic challenges and anti-globalisation sentiment. The economy has been in decline since the Rio Olympics. In an increasingly divided Brazil, mirroring the intense polarisation that characterises the Trump era in the United States and a post-Brexit United Kingdom, whoever takes office in January 2019 is sure to leave a large portion of the country dissatisfied. All eyes are on the Brazilian elections this weekend.